Bullying is once again in the national news, with the report of a 12‑year old middle school student in Nevada who allegedly shot two fellow students and killed a beloved teacher. Reports from fellow students indicated this young man was likely the victim of severe bullying. Sadly, he not only shot others, but then he shot and killed himself. ** In this newsletter, I detail the connection between implementing recommendations from the resiliency research as a strategy to prevent bullying ** and I highlight some exemplary resources/programs that are connected to both building resiliency and preventing bullying. Feelings of safety among staff and students. Supportive relationships are prevalent for everyone at school. Engagement and empowerment of students as valued members and resources in the school community. Clear rules and boundaries are understood by all students and staff. High expectations are expressed for academic achievement and appropriate behavior. Trust, respect, and an ethos of caring is prevalent. Note how closely aligned these components of a positive school climate are to the six environmental protective factors diagrammed in The Resiliency Wheel. Read the Entire NEA Brief by Clicking HERE. The California organization “Community Matters” is my #1 pick for offering strategies that reduce bullying and build resiliency. 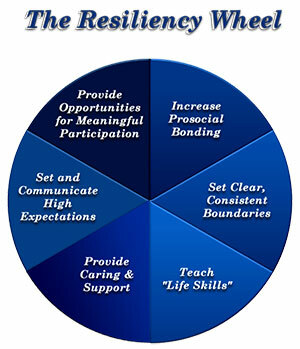 The approach of Community Matters is “an inside‑out approach” that involves utilizing all students in the school as resources for solving the bullying problem — which also increases student resiliency by communicating HIGH EXPECTATIONS, providing OPPORTUNITIES FOR MEANINGFUL PARTICIPATION, increasing PRO‑SOCIAL BONDING, setting CLEAR AND CONSISTENT BOUNDARIES and teaching THE LIFE SKILLS NEEDED for all students to be involved in solving the bullying problem. The core of the Community Matters approach is its Safe School Ambassadors® Program, which utilizes students as the resources to change the school climate in a way that stops bullying. Center for the Study of School Climate, a national clearinghouse with professional development and research components focused on the improvement of school climate, offers a package of resources for schools to assess and improve school climate. CASEL, The Center for the Study of Social and Emotional Learning, offers a list of 10 school‑climate focused assessments with descriptive information about each.